Biodiversity is an abbreviation for the term ‘biological diversity’ meaning the total variety of life forms on earth including people, plants, animals, fungi and micro-organisms. 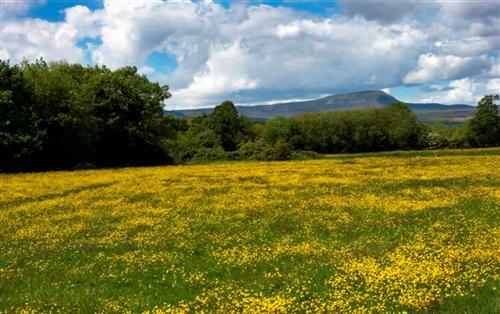 Biodiversity is all around County Cavan from the bogs of the Cuilcagh Mountains to the scenic lakes, wetlands and grasslands within the lowland drumlin landscape for which Cavan is famed. Biodiversity also occurs in our towns and villages whether it is a robin foraging for earthworms in our gardens or lichens colonising walls. Finally the warmth and shelter of our houses supports biodiversity be it a house spider spinning a web in the corners of rooms or bats roosting under the eaves. Biodiversity is important for a number of reasons. It was its own intrinsic value and without biodiversity the world would not exist. The Biodiversity living today is the result of some 3.5 billion years of evolution. It is the biological inheritance of the earth. Biodiversity is part of the daily lives of every one of us; it is fundamental to human existence and is essential to human survival. Biodiversity has important direct and indirect health and economic benefits as well as being intricately bound up in the cultural heritage of the County. Cavan County Council Heritage Office has produced the Cavan County Local Biodiversity Action Plan (LBAP) which sets out a range of actions for the conservation and sustainable use of biodiversity. It stimulates effective local action, creates awareness and promotes biodiversity at the local authority level. It involves a partnership approach. The Cavan County Local Biodiversity Action Plan translates International, European and National legislation and obligations in relation to biodiversity at a local level. The preparation and adoption of this plan will provide a framework for the conservation of biodiversity. It will assist sustainable planning and development and raise public awareness of biodiversity through engaging a number of people from wide ranging sectors. To ensure that natural heritage related matters are communicated effectively to all sectors.